I’m heading down into the basement today to plant lemongrass. Yes, here in Vermont. A dozen plants or so. And then I’ll come back up to the kitchen and make some delicious lemongrass-coconut chicken soup using broth I made and froze last fall. I’m never without lemongrass in my kitchen. Although I’m primarily inspired by Mediterranean cuisine, I do need a Southeast Asian fix at least once a week. As an essential flavor of that region, lemongrass makes its way through many of our meals. I use the light lemony herb in soups, chicken, fish dishes; in marinades and pastes like Eating Well’s Thai lime and Lemongrass Marinade; as grilling skewers; in desserts such as lemongrass pots de crème; in tisanes and syrups. People think I am adventurous in the kitchen; I think I’m sensible by planting my favorite flavors. When I spot pale stalks in the market going for nearly $20 a pound, I feel rather pleased with myself. I don’t need to buy lemongrass. Nope, not even here, halfway across the world from where it originates. Perhaps it seems all upside down to grow it in Vermont, but then again I also happily grow lavender, eggplants, tomatillos, artichokes, figs and all manner of vegetables, fruits and herbs not associated with these cold climes. I’m determined to use them, I want them fresh, and there’s such satisfaction in pulling a stalk of lemongrass out of its grassy clump right before I need it in the kitchen. I’m sure it tastes different from the same plant grown in a Thai garden–our soil and climate conditions make that inevitable–even so, I’ve never tasted store-bought lemongrass that can rival what comes straight from the garden. Lemongrass grows easily as an annual herb, started from seed right about now, or as transplants found at garden centers. There are two varieties, East Indian and West Indian; the first is what you get in seed packets, and the second what you buy at the nursery. 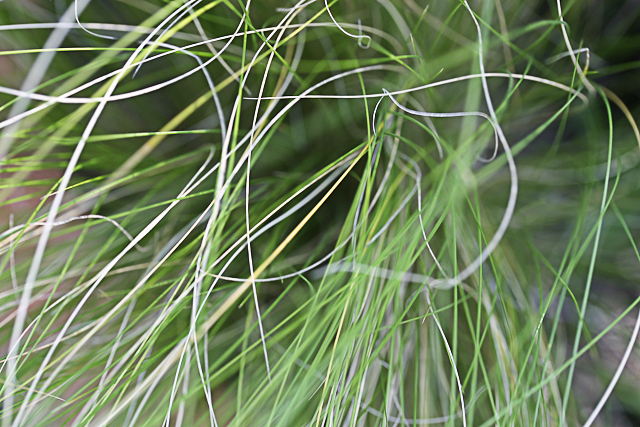 Supremely grassy, the Eastern cultivar sends out lots of thin leaf blades. The stalks do not, in my experience, swell into fat bulbs. 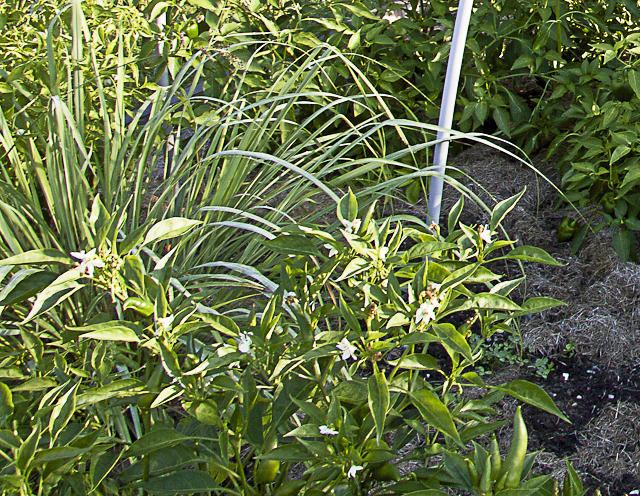 The Western variety seems to grow faster, taller, with much thicker bulbs, the kind you see on green grocers’ shelves. I grow both kinds–Eastern for infusions and broths, Western for recipes calling for the chopped tender core of the stalk. I love the herb so much that I grow it in patio pots, tuck it into empty corners of the garden beds and all through the grass garden. It provides visual as well as culinary interest–a double winner! So here I go to dream of light summer curries and iced lemongrass teas as I plant the seeds and wait a couple of weeks for them to surface. They take their time, all through the season, but I’ll wait for them, gladly. In the depths of winter, I’ll succumb to temptation and buy a small burgundy head of chioggia radicchio at our local natural foods cooperative. I’m shocked at the price of a green that in my experience couldn’t be easier to grow. Perhaps people think that because of its high price it must be challenging to grow. Or perhaps they don’t think they like its slightly bitter note when served raw. Perhaps they’ve never tasted how delicious it is when picked young and grilled or roasted or sautéed. It asks to be paired with the dark sweetness of balsamic vinegar, and is a revelation grilled and wrapped around fresh mozzarella. 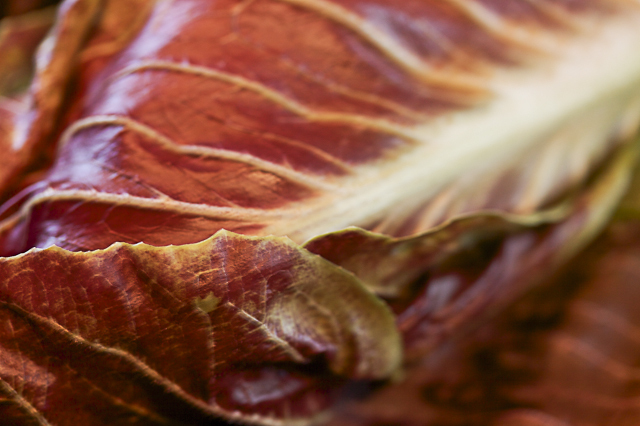 What’s more, radicchio adds a lovely bit of color to whatever dish you make. When I visit Italy, I am wowed by the varieties of radicchio in the green markets: the tall treviso, the nearly scarlet varieties, the chubby balls of maroon chioggia. The Italians are passionate about this variety of chicory; according to Wikipedia, even back in 77AD Pliny the Elder extolled its virtues. Well, I can’t get enough of the stuff in my kitchen, and so I grow a lot of it. Radicchio’s a cool weather plant, which ordinarily would mean planting it in late summer here in Vermont and harvesting it in deep fall, but I grow and harvest it from April until November. Indeed, it’s already growing away down in my basement under grow-lights next to its cousin endive. By late March it will be about four inches high and ready to go outside under a tunnel if it’s a bitterly cold spring, or out in the open garden if no deep freeze is predicted. 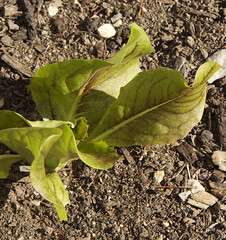 Radicchio doesn’t mind a light frost, and it likes to mature in cool conditions, so I don’t worry about it shivering.. If the temperatures threaten to dip into the low 20s, I’ll slip an old plastic milk jug over each plant to give it just a bit of protection. On the other hand, during a hot summer it can grow bitter and tough, and so I throw shade netting over it in high heat. Its shallow root system makes it thirsty, so when it’s dry, I’ll give it a drink to prevent it from getting bitter. To get the most out of a head, I don’t dig up the whole thing at once until it is quite mature–about three months after I plant the seeds. But early on, I start taking a few leaves from several plants at a time, without harming the plant which will continue to tighten its head as it matures. And so, yes, I treat myself to outrageously expensive radicchio in the winter once or twice in that short period when it is not growing in my house or in the garden. But now that it’s March I cheer it on when I head down to my basement growing station. Soon, soon, it will play a starring role on our table.